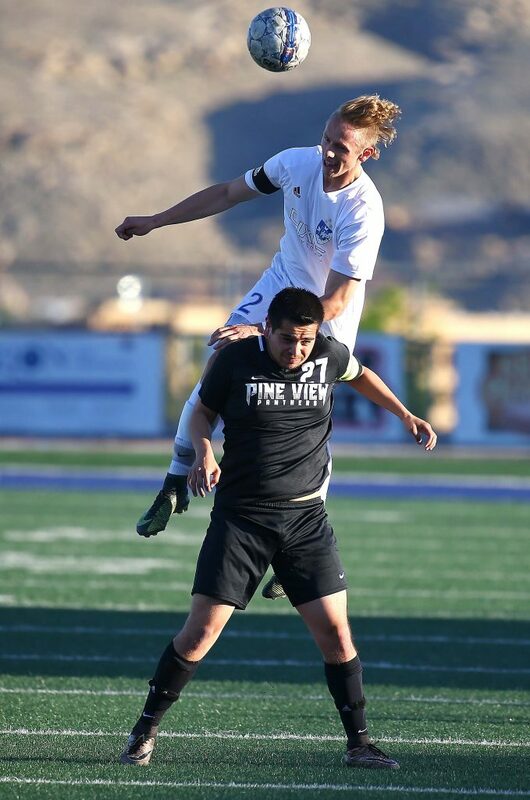 ST. GEORGE – With Snow Canyon on a bye, the Dixie Flyers seized first place with a home win against Pine View in a game that was delayed for 20 minutes due to an injury and red card situation (more on that below). 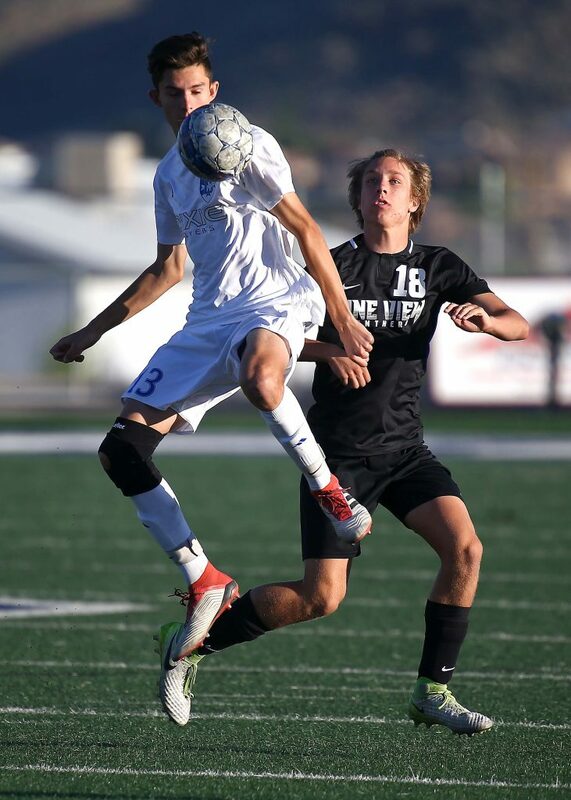 Meanwhile, Desert Hills won big over Canyon View and is virtually assured of a playoff spot with the victory. And Cedar got its first region win of the season in a nail-biter against Hurricane. It was a bit of a bizarre night at Walt Brooks Stadium as the Flyers won fairly easily in a disjointed game. Midway through the second half, with Dixie leading 3-1, a Panther player took a kick to the face. The injury and resulting red card stopped the game for about 20 minutes. An ambulance was called, but apparently the operators couldn’t figure out how to get to the field and ended up being delayed as they tried to locate field access. 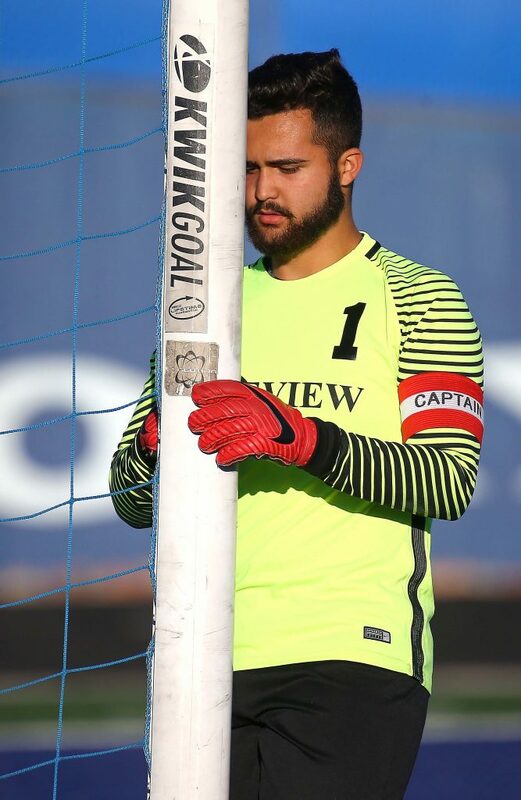 Once the injured player was taken away (by his parents, not the ambulance), Dixie’s player was assessed a red card, despite the kick to the face being unintentional. 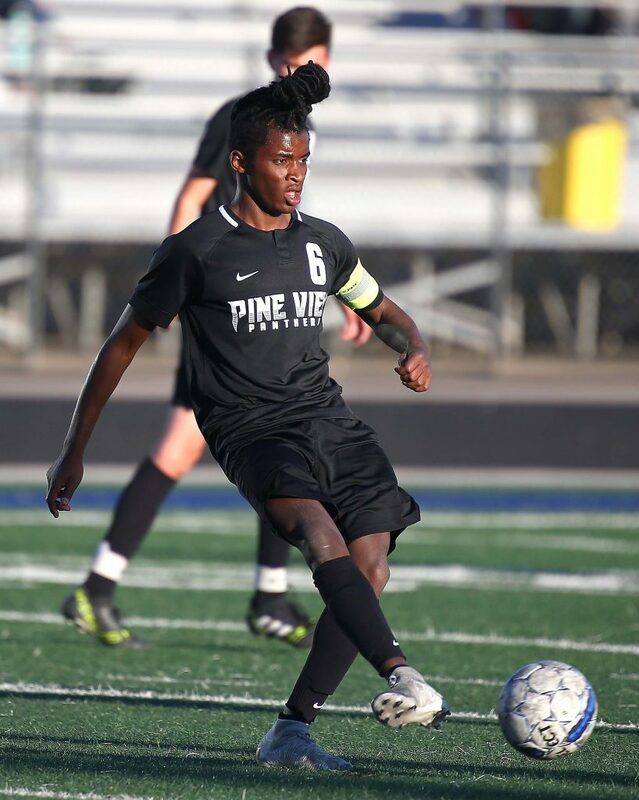 Pine View was awarded an indirect free kick, which means it must be touched by at least two players before it can be counted as a goal. The Panthers kicked it in for a score – but no one else touched it and it was disallowed, causing some confusion on the field. 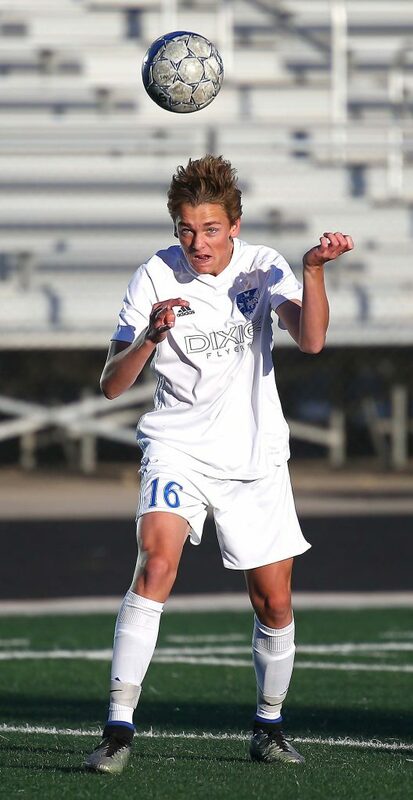 Playing a man down the rest of the game, Dixie notched two more goals and came away with a 5-1 victory. 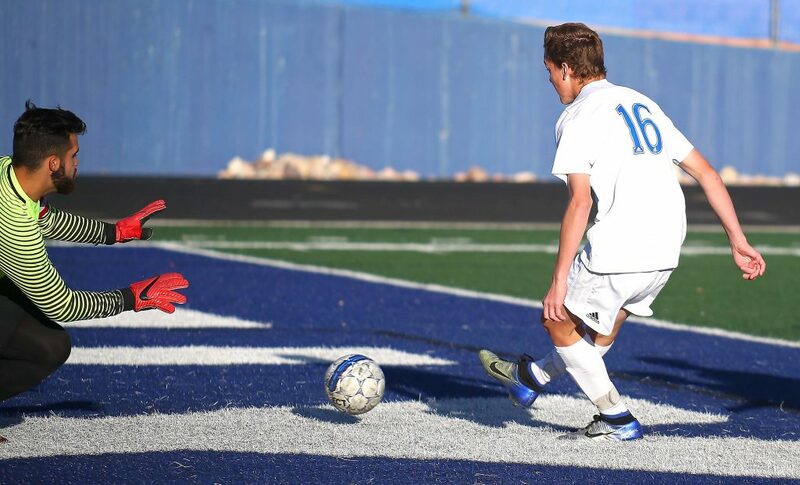 Andy Rich scored the first goal of the game for Dixie in the first half. It is his sixth of the year and gave the Flyers a 1-0 lead. 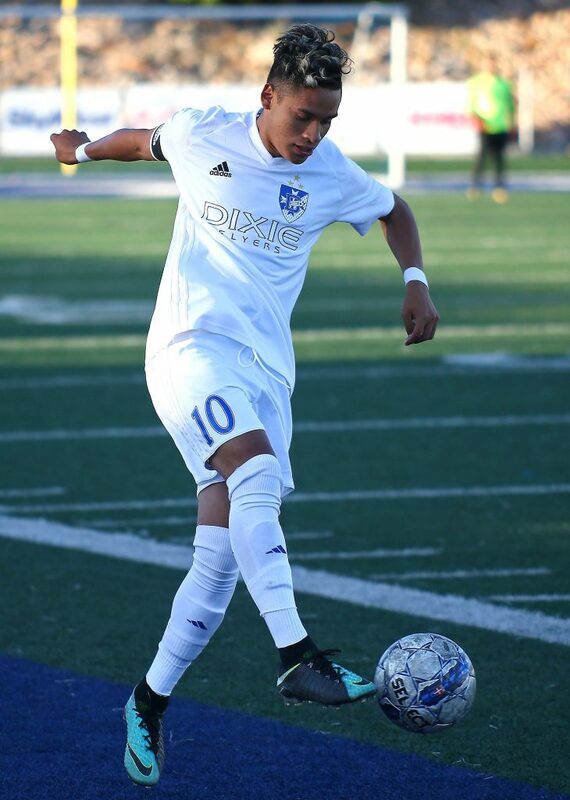 Oscar Quintero then scored the next two goals for the Flyers to make it a 3-0 lead just before halftime. 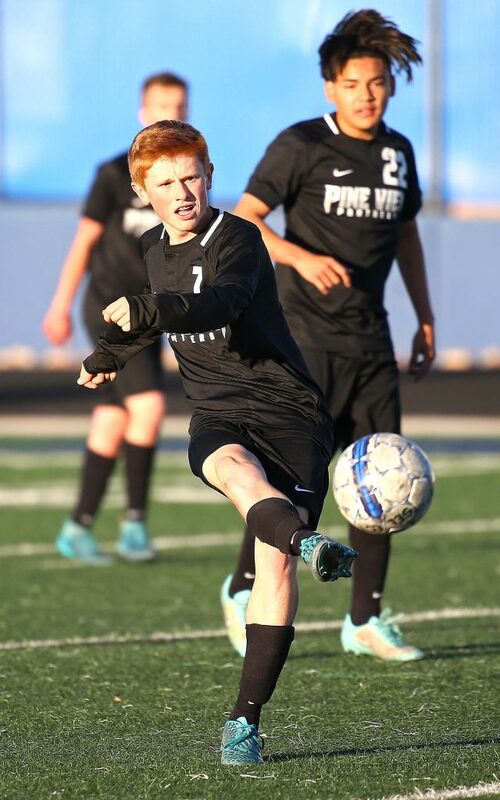 Pine View’s Kaleb Atkinson scored on a free kick from about 25 yards out to make it 3-1 at intermission. 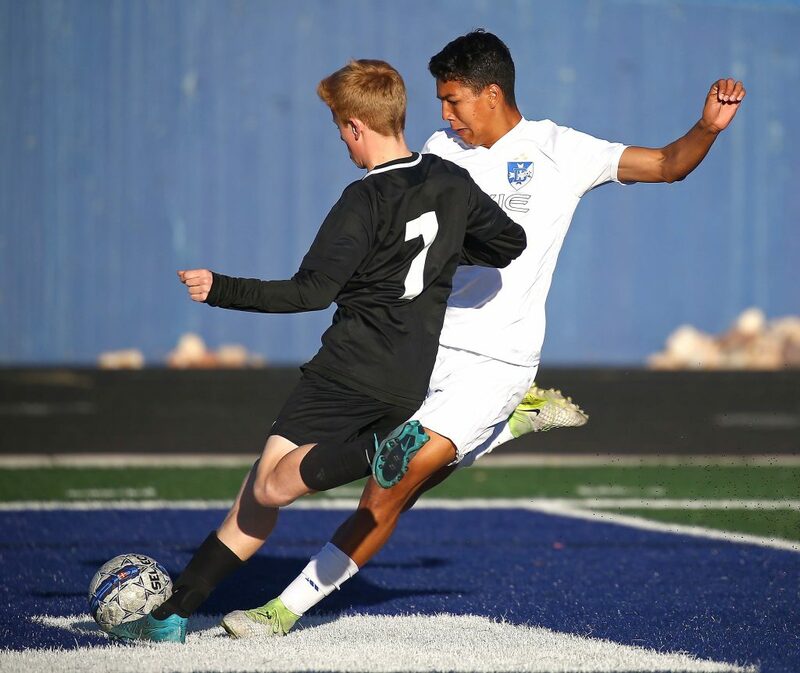 Jose “Tauri” Morales, who has missed much of the season with an injury, scored the last two goals for Dixie. 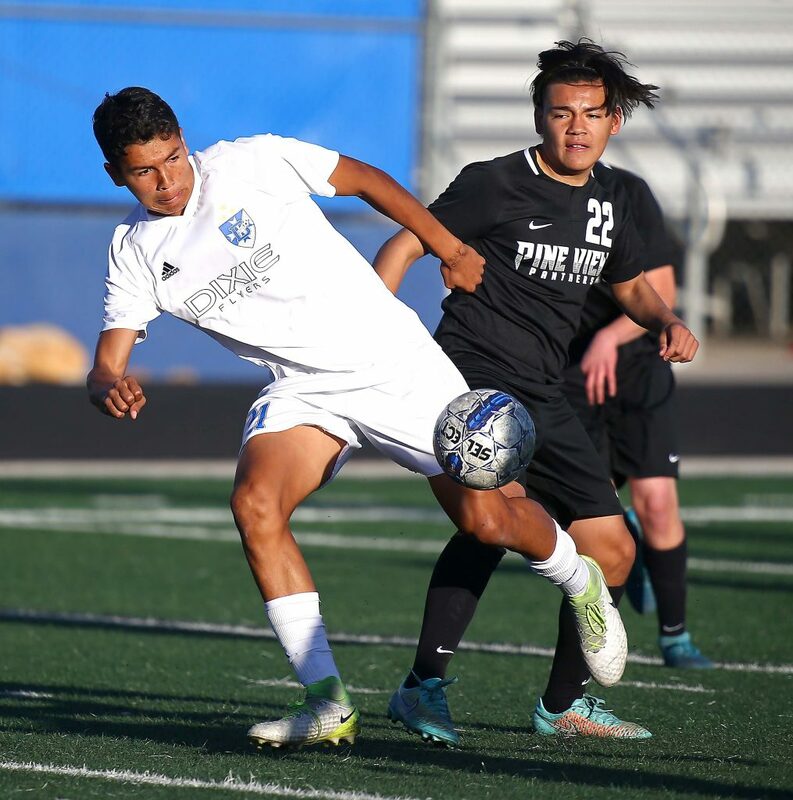 Quintero leads the Flyers with 11 goals, while Morales notched his sixth and seventh of the season for Dixie, which improves to 9-0-3 overall and 7-0-3 in Region 9 matches. The Flyers have 24 points, three ahead of Snow Canyon for first place and five ahead of third-place Desert Hills. 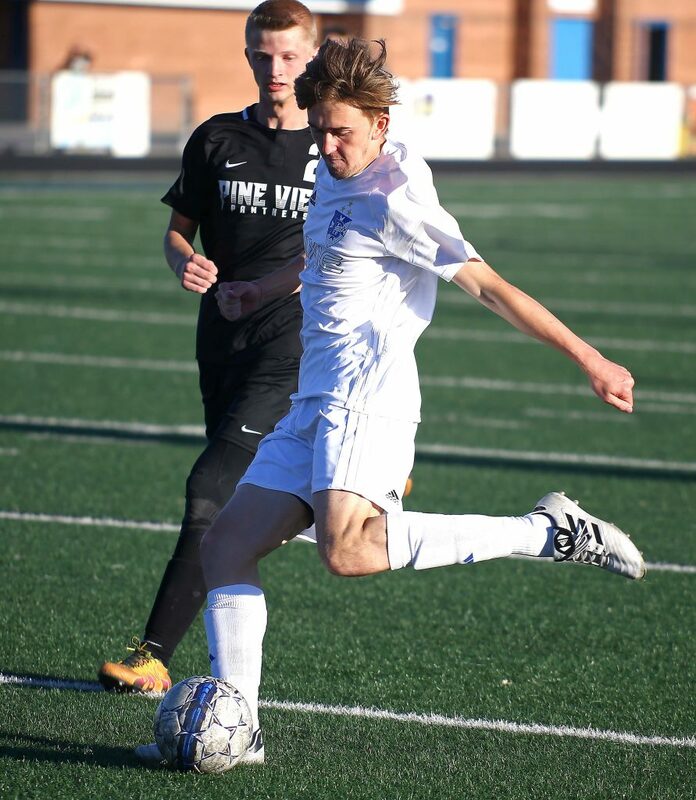 Pine View drops to 4-7-2 overall and 3-4-2 in region play. The Panthers have 11 points, one behind Canyon View for fourth place. 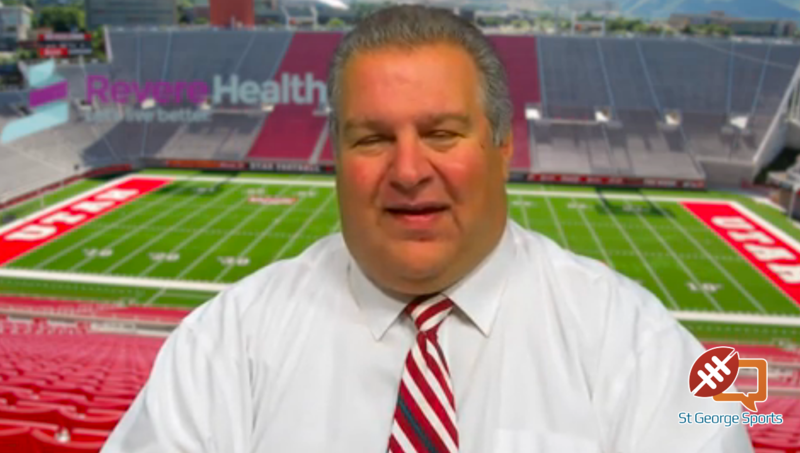 Dixie hosts Hurricane Thursday night, while Pine View is home for Snow Canyon Friday night. 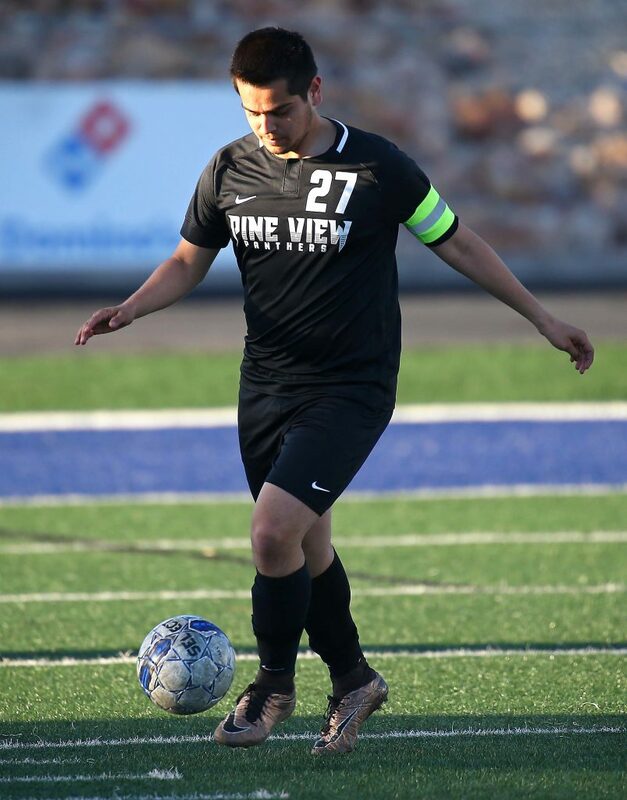 Editor’s note: Time stamps show the actual response time between the original call to dispatch and the reporting person’s advising that they are self-transporting was 12 minutes during the Dixie-Pine View soccer match injury incident. 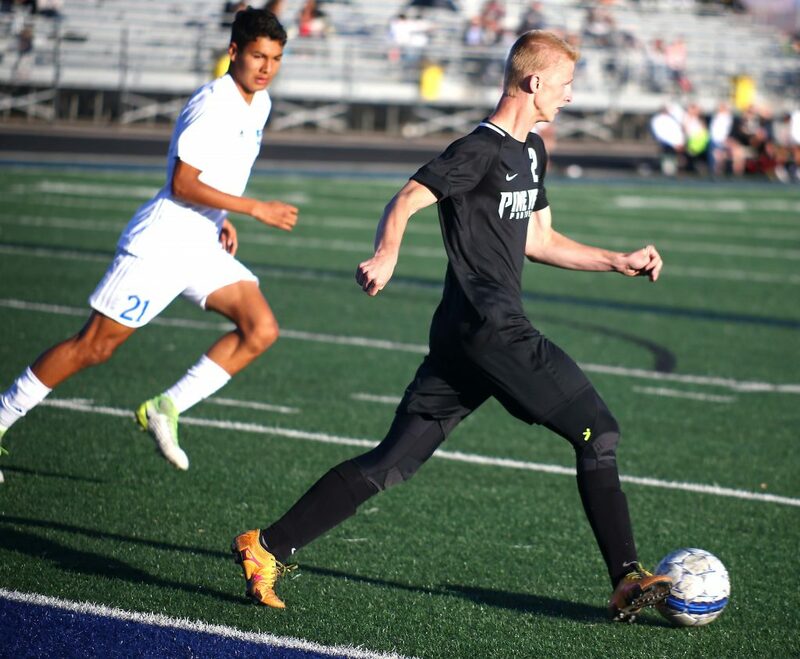 It was only 1-0 at halftime, but the Thunder and Ben Simister blew it open in the second half. 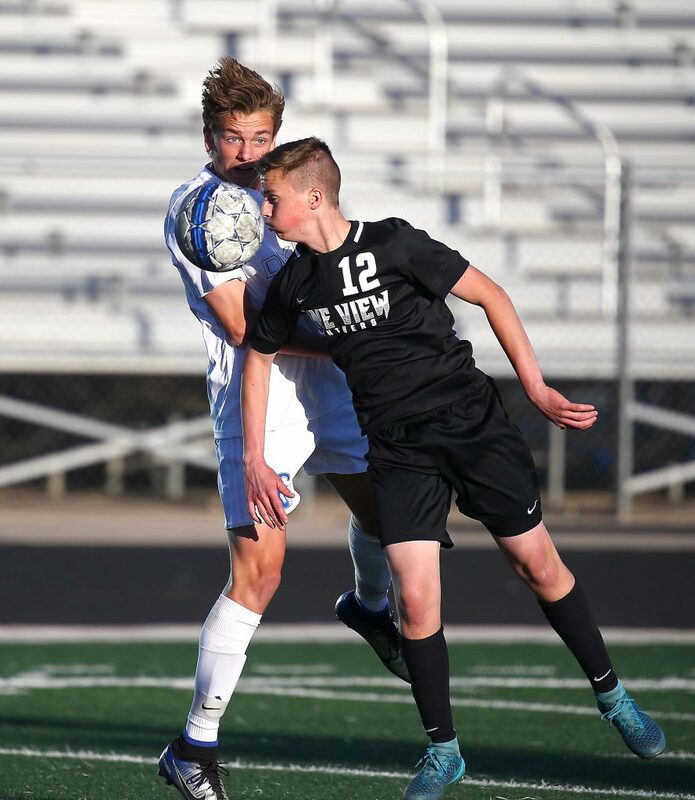 Simister scored the hat trick with three goals for Desert Hills, plus the senior assisted on the Thunder’s other two goals for a near perfect night. 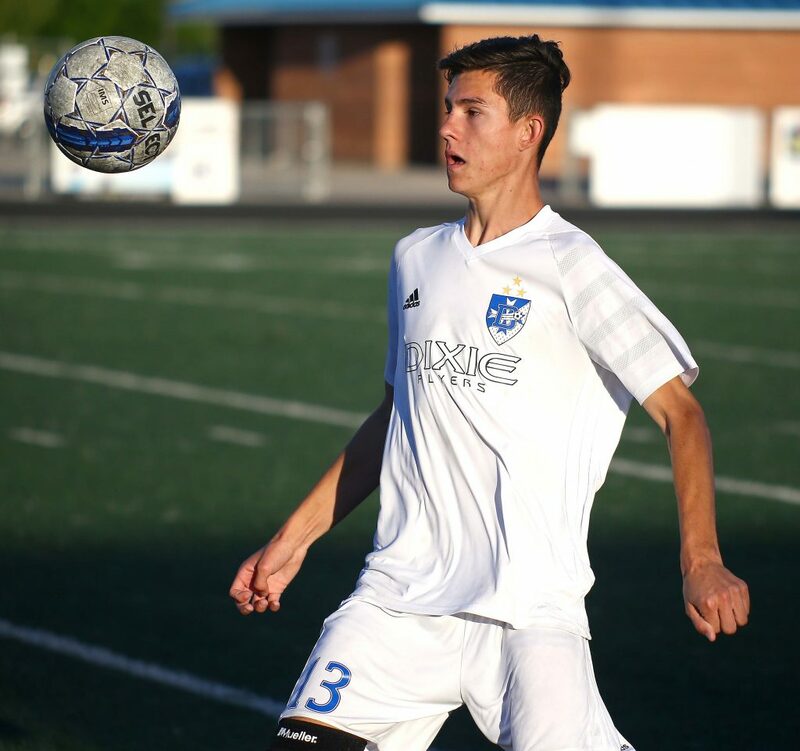 Simister scored his first goal in the first half, then assisted early in the second half on strikes by Garrett Cottle and Sawyer Heaton. Simister then scored on a penalty kick and a loose ball in the final two minutes of the game for the trifecta. Preston Hodges got the shutout for the Thunder, his sixth of the season. Simister leads the team with 12 goals in 13 matches. Cottle notched his first of the season, while Heaton got his fourth. 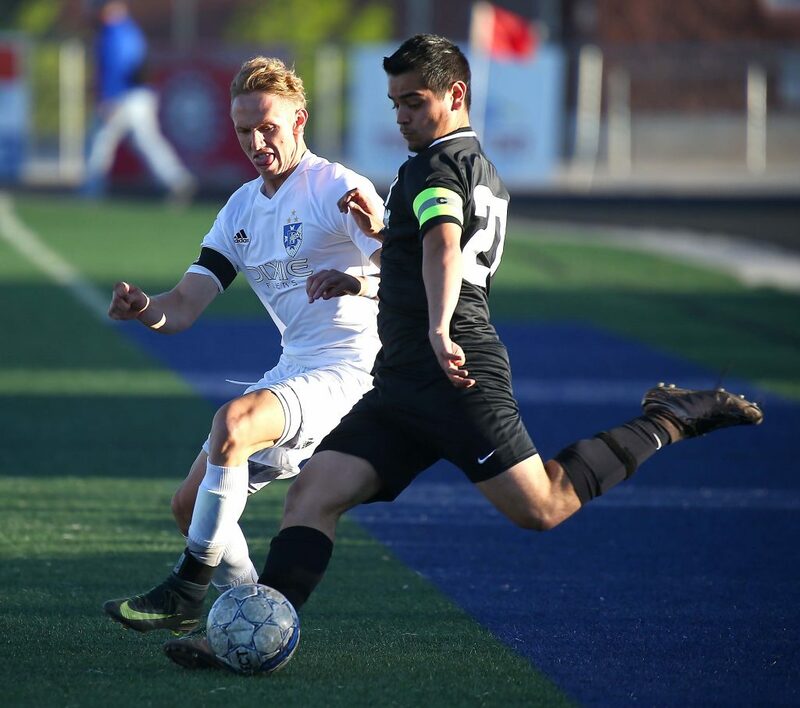 The Thunder are 7-2-4 overall and 5-1-4 in region (19 points) and have all-but clinched at least third place. 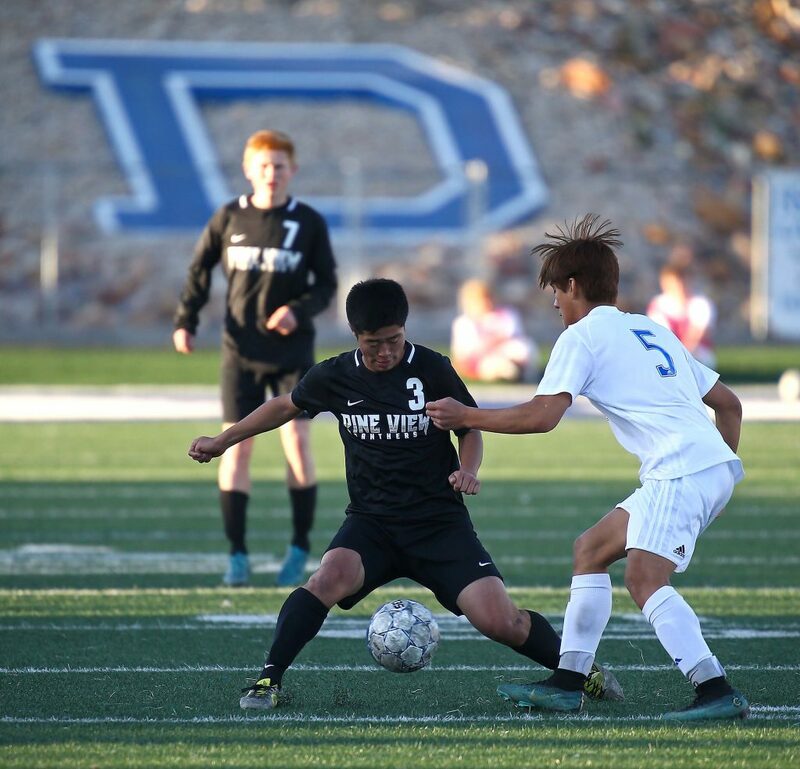 D-Hills trails Snow Canyon by two points and first-place Dixie by five. DH is off Friday and plays again next Tuesday in a road match at Hurricane. 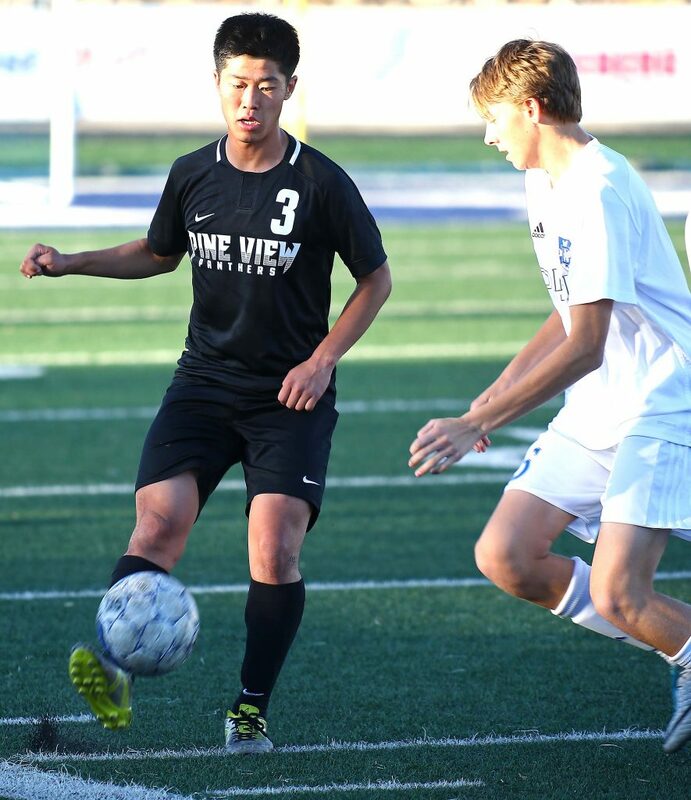 Canyon View, 4-7-2 and 4-6-0, still holds a one-point lead on Pine View for fourth place. The Falcons have two games left, but the Panthers have three. 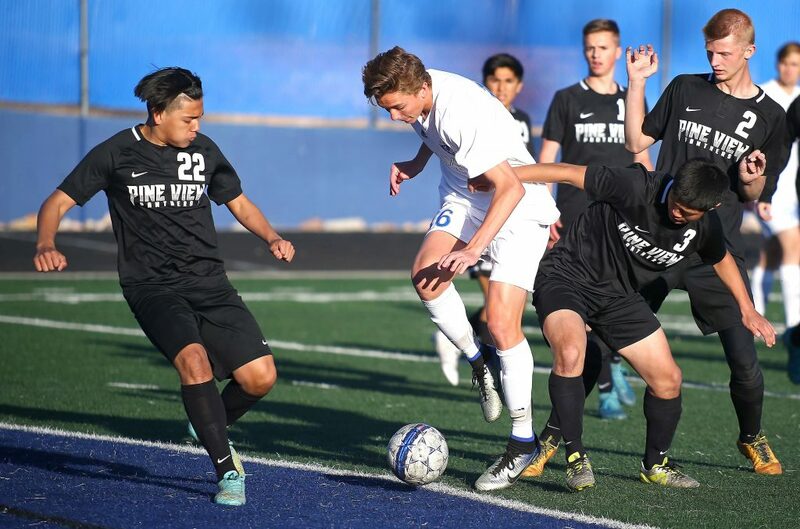 Canyon View hosts Cedar on Friday, while Pine View hosts Snow Canyon. 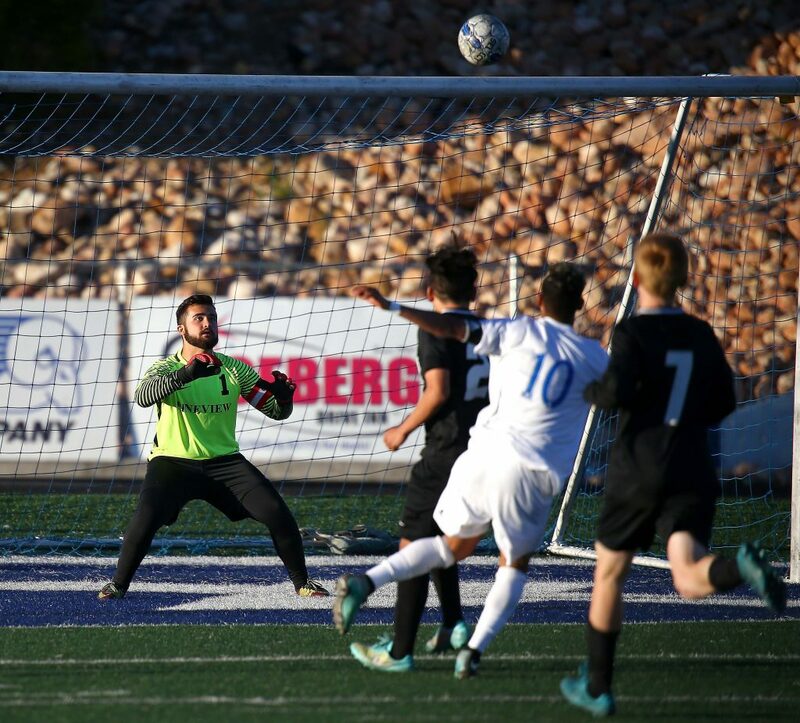 The windy afternoon game in Cedar City saw just one goal hit home. Tito Garcia scored in the first half for the Redmen on what turned out to be the game winner. 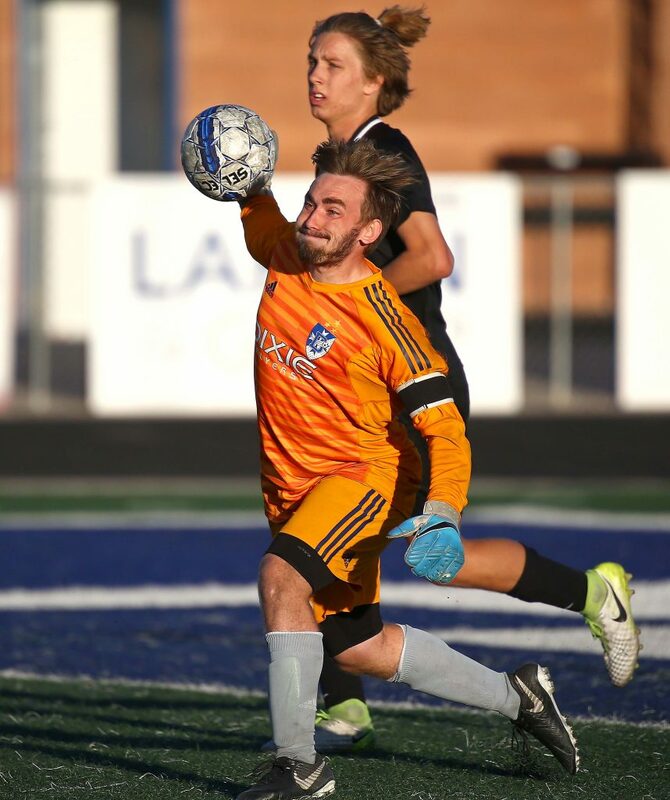 Cedar used two goalkeepers to preserve the shutout, with Karson Bleazard and Tige Loveland teaming up for the whitewash. 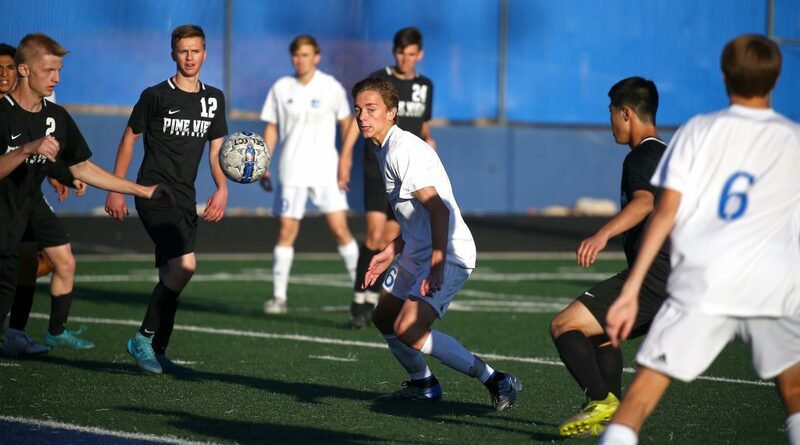 Cedar, 2-9-0 overall and 1-8-0 in region, is at Canyon View Friday, while Hurricane is at Dixie Thursday. Both teams need to win out to make the playoffs. Hurricane at Dixie, 7 p.m.
Cedar at Canyon View, 4 p.m.